If you get annoyed by PS4 DVD playback issues/problems, this post will give you some easy ways to get them solved! PS4 Feature and Problem: PS4 has released for some time. Its fans may be in bittersweet moods. With a 4k (3840x2160p) display and lossless 7.1 channel and an eight-core Jaguar CPU, paired with a Radeon 7000-series GPU, it is amazing for playing games and watch movies on PlayStation 4. But its BD/DVD disc drive sometimes could really drive you crazy and freak you out, especially some PS4 DVD playback issues and its game disc reading problems. Here are some common issues that users of PS4 have encountered and their suggesting solutions. Do remember that you could always try to get help from PlayStation Support/Blog/Forum. 1. Unexpected game disc/DVD ejection and followed with no acceptation of the discs. Official Solution: First, hold down the power button until the system beeps twice. Then wait about 30 seconds until all system lights are off. Unplug the power cord for three minutes. If the issue isn't exterminated, visit Sony online Service Request page. 2. When playing game DVD, it shows "NO Disc Inserted" or "Unrecognized Disc"
Official Solution: Delete the game app data and reinstall it. If failed, try PS4 safe mode options. Solution 1: Clean your disc with a microfiber cloth. The disc reader is really sensitive to scratches and fingerprints. Solution 2: If your disc is BF4, try another one. Some users report they just have problems only on BF4. Solution 3: Dissemble your disc drive. Visit YouTube to know the detailed steps. Classic Solution: Take the disc out and reboot your PS4. Solution: Try to eject the stuck disc manually. After you tried all possible solutions and were at full stretch, chances are that you were still not able to get PS4 DVD problems worked out. Well, for your game discs, you may better contact your dealer or go directly to Sony. For your movie DVDs, there is an indirect but easy way - you can convert your DVD to MP4 (DVD to AVI, MPEG2 also available, while MP4 recommended for best quality) for PS4 with nearly the same high quality by a professional DVD ripper - WinX DVD Ripper Platinum. Just a few clicks and some minutes, you will get a high-quality movie video playable on your PS4. Download and install WinX DVD Ripper Platinum first. Then run this DVD to PS4 converter. You could choose "Use High Quality Engine" to make sure a high quality with an increase of the conversion process time. Click "DVD Disc" and "Select the source DVD disc" to choose the DVD movie you want to watch on PS4. Hit "OK" to start loading. After loading, the Output Profile would pop out. Choose "Sony Device" under "Device Profile". Step 4: Choose the Specific Format for Your Particular Device. Choose "to PS4 Video" under "Sony Device". Then choose "PS4 (H264)", or "PS4 (AVI/MPEG4/MPEG2)". Step 5: Select Output Folder. Click "Browse" to specify an output folder on your computer to save the output files. Or just click "open" to use the default option. 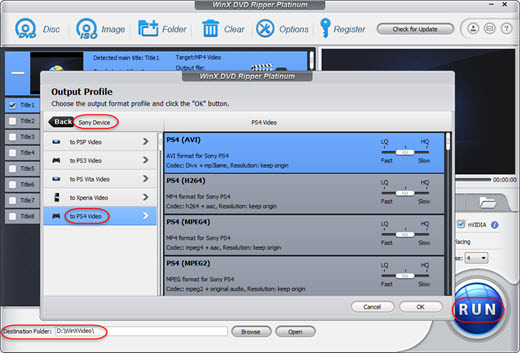 Since the hardware encoder options and the right movie title can be detected and checked automatically, you only need to click the "RUN" button to start DVD to MP4 converting after finishing the above steps. When the conversion is done, you could enjoy the high-quality MP4 file on your PS4. Just by a few clicks, the problem for playing DVD on PS4 gets resolved. Now, you can never bother to ask yourself: "Why my PS4 can't play DVD? or why I can't play DVD on PS4?" Just enjoy yourself with PS4 without the annoyance of PS4 DVD playback issues. More than converting DVD to PS4, it can also convert DVD to other devices like PSP/PS3; Xbox/Xbox One; iPhone, iPad, Apple TV; Samsung, Google, Huawei, HTC etc, at No.1 fast DVD ripping speed. Lydia Wong was a passionate marketers of Digiarty Software. She shared brilliant ideas of promotion and marketing. Her writing skills were greatly appreciated as well. How to fix Xbox One or One S won't read, recognize or play DVD discs? See this quick and simple guide on all the Xbox One not reading disc problems on Windows 10. This article is talking about how to play DVD movies on Nintendo Wii by converting DVD movies to Wii with the best DVD to Wii ripper.